The woodcarving village is a beautiful, historic village that has been known for its great woodcarvings and woodcarvers since ancient times. 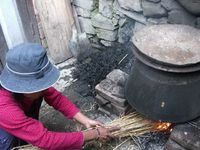 I can take you to for a visit, homestay, and/or to study in this village where I used to live as I studied woodcarving. It has beautiful mountain views and is surrounded by the fields of subsistence agriculture of the people of the village where one can see (and if interested take part in) local agriculture or just walk through the beautiful terraced fields. 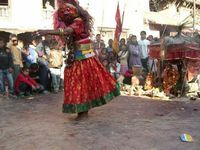 Many times through the year the village has the added colors of its festivals. 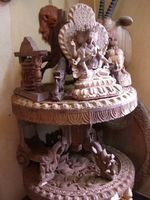 Tours of other woodcarving and artisan communities are also available in the greater Kathmandu Valley as well. The village still seems to be a beautiful step back to an ancient time. No roads cut through the village, leaving it peaceful for living and walking and the creations of their masterpieces. 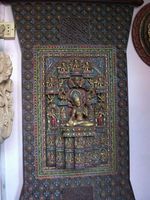 It has been a small village that has been focused on the art of woodcarving in this very location for over a thousand years. 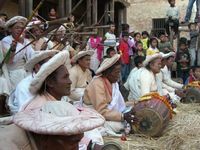 The inhabitants of the village are Newars, the original inhabitants of the Kathmandu Valley and the famed traditional artists and craftsmen of Nepal. 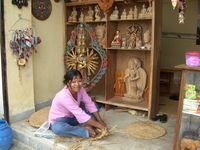 You may study about the art and spend varying amounts of time trying your hand at Nepali style woodcarving, making rope or mats from straw, Newari cooking learning to make local foods and/or beverages. If you are interested in trying to learn to do some of these things tutorials are arranged based on your schedule and desires.